This is a revised and improved version of our original gluten-free pie crust recipe. This butter-rich gluten-free pie crust is easy to make using a food processor. Use it for all types of pies, savory tarts and quiche fillings. Measure dry ingredients into a large mixing bowl. Use a whisk to thoroughly blend ingredients. Pour the dry ingredients into a food processor bowl, fitted with a metal blade. Add the cold butter cubes and pulse until the butter cubes are reduced to the size of peas and the mixture looks crumbly. Add the egg and pulse just until egg is incorporated into the flour-butter mix. Add ice water, one tablespoon at a time and pulse several times. Add just enough water to get the ingredients to hold together when squeezed in your hand completely. If the dough is too crumbly and dry, add additional ice water and pulse several more times. Check the consistency of the dough again. If the dough holds together and you can form a ball don't add more water. Adding too much water will make the dough sticky and harder to roll out and shape. Scrape the dough, which will look a bit crumbly, on a clean, gluten-free work surface covered with waxed paper. Gather the crumbly dough into a ball. Divide the dough into two pieces and flatten into discs. Place each disc in a plastic bag and refrigerate for at least one hour before rolling out the dough. Note- At this stage, the dough can be frozen. Place wrapped dough in a freezer bag, label and freeze for future use. Remove dough from refrigerator and place dough between two sheets of waxed paper. Let dough sit just until it's soft enough to roll. When workable, roll from the center outward, working to make a circle about 10-inches in diameter and 1/8-inch thick. If the dough gets too warm and sticky, place it in the freezer for several minutes and then continue rolling it. Peel top sheet of wax paper from the dough and carefully flip the dough still on the remaining piece of waxed paper over a 9-inch pie plate. Gently peel the waxed paper from the dough. Gently fit the dough into the pie plate. Trim edges with a knife and crimp edge with a fork or using your favorite method. Pie crust is ready to fill or partially bake as desired. To partially bake the crust, preheat oven to 350 F. Use a fork to pierce the crust - this will prevent the crust from bubbling up while baking. Or, line the dough with parchment paper and fill the plate with dry beans or pie weights. Bake the crust for about 15 minutes, or until lightly golden. Bonus Use for Leftover Dough: Roll out leftover dough scraps, butter, and sprinkle with cinnamon and sugar for an old-fashioned treat. 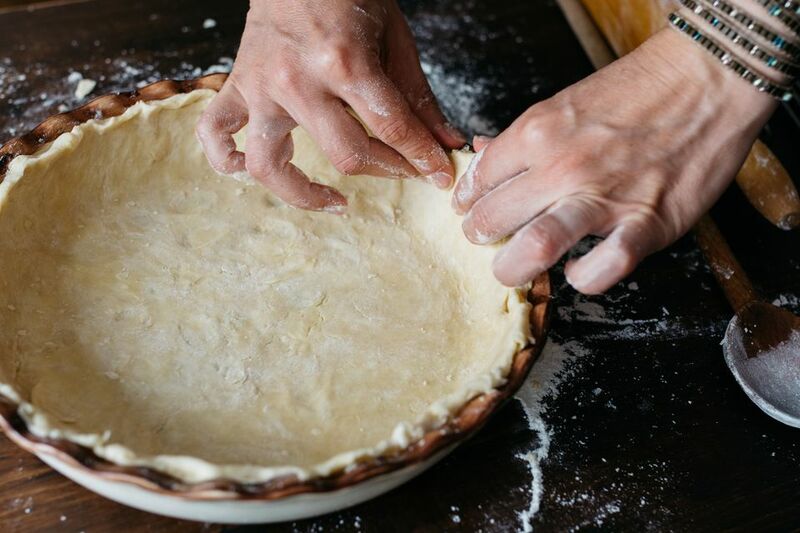 Tip: A tart pan with a removable bottom makes shaping and cutting pies much easier. You can find tart pans at most large cookware stores or online. Gluten-Free Pumpkin Pie -- It's Possible and Good!